In April 2011, the International Standards Organization (ISO) published the second edition of the ISO/IEC 20000 standard. The new edition includes for the first time the term 'service management system', requiring an IT organization to demonstrate an integrated approach for establishing, operating and improving the service management system, placing a greater emphasis on customer satisfaction, and requiring an annual internal audit. The standard also introduces numerous new requirements and represents a serious differentiator for organizations and individuals. 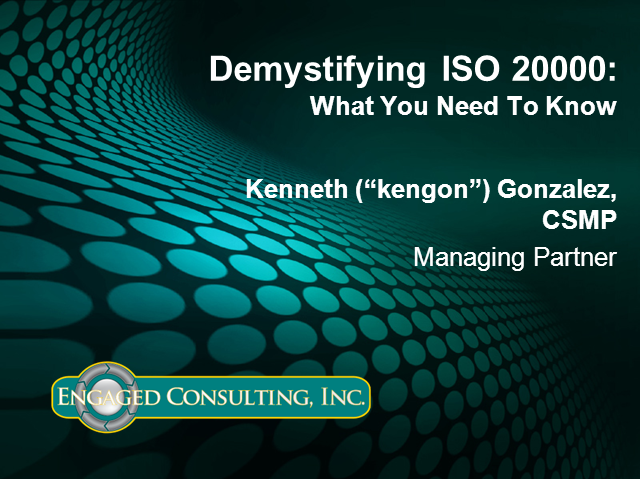 •Why is ISO 20000 certification important to my organization? •What value does demonstrating conformance to the standard provide? •What does it take to prepare for an audit? •What does it mean to operate a service management system? In this session, we will address the key things that practitioners need to understand about the ISO/IEC 20000-1:2011 standard, how this is related to “Next Generation Service Management” and some of the resources available to help them on their journey. We will go beyond the “common sense” connections and identify the key elements required to have you, your team and organization be successful with ISO 20000.